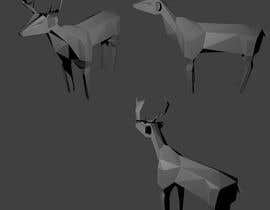 We need a 3D deer made up of flat surfaces, so that we can cut up cardboard and make a life-sized Stag. Attached is just an example of an animal made from flat cardboard. We would not want any more pieces than this. The stag wants to be walking or standing on all four feet with his head up. The legs must be of flat sections and not round. We envisage the antlers built up from layers of glued cardboard. We just require a finished model, where we can copy each section and work out our own tabs to connect along the joins. 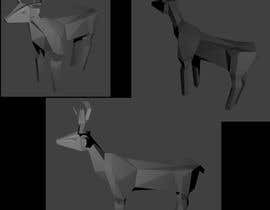 The figure wants to be more stylised, than realistic. The cardboard will not be printed or painted, but left a natural brown, so the flat sections should not be shaded. You should however add significant details we can paint on such as the eyes and nose. 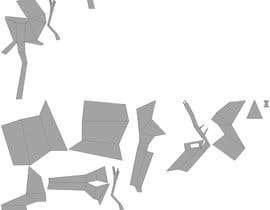 It is not easy to curve cardboard or fix in shape, so the specification is for flat pieces, if however the image can be significantly enhanced by the odd curve such as when forming the nose, this will be OK as long as it is only in one direction. The format needs to be in something we can access. We only have Autocad or Google Sketchup. We would also be happy to download and learn any other 3D software that was free, or shareware. This is not a commercial project so the budget does not really exist. Unwrapped version in entry 7.
perrybond, you are not helping again... is this fair? 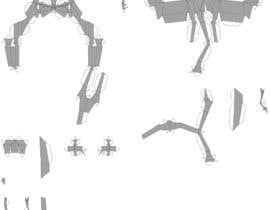 #5 : V3 model with further polygon count reduction. Any specific requests toward posture or further tweaking? Feedback on submission read and replied. Will continue tweaking. There is this public clarification board where messages can be left. Private messages can also be left behind each entry, but I cannot see them unless I click on the entry then refresh it. I also do not get any notification of new messages here. So basically, unless I sit here refreshing the page and continually clicking through each image, I may not see all the messages. #3 the format of the file is .obj, so you can access, manage and modify it in any 3D program or utility you have. Last contest I had too many entries, this one none. If you're the only entry (and it doesn't look like a donkey!) you'll get the money! 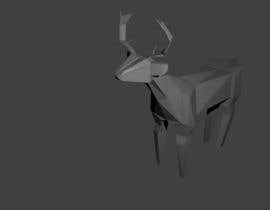 Just to clarify, you guys want a stylized low polygon model of a stag? 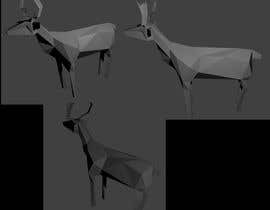 Would you be willing to try blender 3D? It's opensource.